A collection of chants that Invoke the Divine via the Names and Declarations of Divine Realizer Avatar Adi Da Samraj. The CD beautifully explores a vast array of cultural styles and instruments. It is uplifting, absorbing, and inventive—a sublime celebration! "True Water—cool, clear, and surprising." David Epstein, Ginger Epstein, Jacqueline Duba, Ray Lynch, Tom Stiles, and Judith Parkinson. 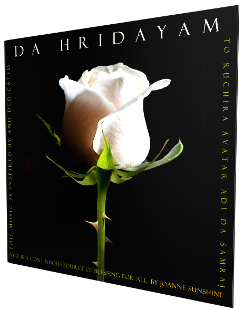 This CD was inspired by and is dedicated to Ruchira Avatar Adi Da Samraj. JoAnne Sunshine has devoted many years to studying and practicing the art of sacred devotional singing in the company of Avatar Adi Da Samraj. She has composed chants, arias, rock, gospel, choral, and instrumental music as devotional gifts, and participated for many years in The First Amendment, an Adidam choral group directed by Eric Leber—first as a soprano and then as a composer. Her published material has enjoyed longstanding appeal and has included collaborations with Ray Lynch, John Mackay, John Hartman of the Doobie Brothers, Byron Duckwall, Rich Duvall, Richard Kane, and Dik Darnell.